Wow! I have to say I’m happy for Chris Bosh. I had couple opportunities of meeting Mr. Bosh and he is such is cool and humble guy. TORONTO (October 23, 2008) – Nike Canada and Chris Bosh announced today the launch of CB4, the star athlete’s signature apparel line and Nike Hyperdunk shoe. The Nike Hyperdunk is the company’s strongest and lightest basketball shoe ever made. 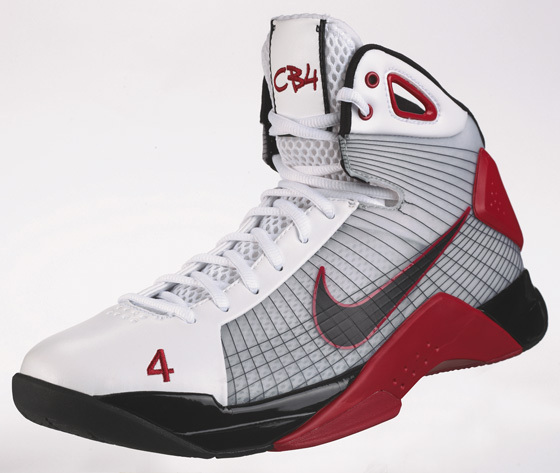 The CB4 apparel and CB4 Nike Hyperdunk will be available exclusively in Canada as of October 30, 2008. The CB4 apparel features a collection of hoodies, t-shirts and shorts. The CB4 graphic on the apparel is an iconic silhouette of Chris’ facial expression symbolizing his love and passion for the game of basketball; the line treatment in the graphic ties back to the Flywire technology element featured in the CB4 Nike Hyperdunk shoe. The Hyperdunk combines two of Nike’s latest and greatest innovations: Flywire technology and Lunarlite foam. Flywire redefines footwear construction, shaving off weight and adding strength, allowing athletes to be lighter on their feet and faster on the court. Lunarlite foam features a unique cell structure making it lightweight and ultra responsive as a cushioning system. The Nike Hyperdunk is worn but athletes such as Kobe Bryant, Lamar Odom and Amare Stoudemire. The CB4 product will available at Champs, Nike Toronto and Centre Sports in the Air Canada Centre.